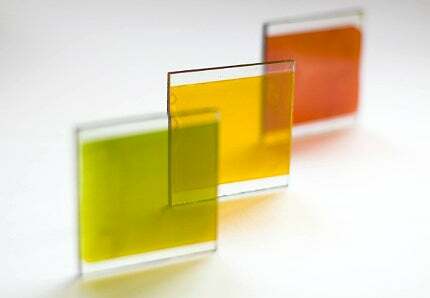 A new innovation that can 'print' coloured glass and use it to harness electricity from the sun's rays is currently reaping awards – so what's all the hype about? Dr. Henry Snaith with the coloured glass. Snaith and Arthur are both integral to Oxford PV. Kevin Arthur says you're most likely to see the solar glass on new, commercial buildings in the first instance. Dr. Henry Snaith and his team of 17 academics used non-toxic solar cell materials that are screen-printed directly onto the glass to make the solar glass. The cell material is both transparent and self coloured. Different colours render a different efficiency. An Oxford University spin-off company that can create solar energy from coloured glass has been awarded its second prestigious award in two months. Oxford Photovoltaics (Oxford PV) was named winner of the Best Early Stage Investment in a Disruptive Technology Business award in July at the annual UK Business Angels Association Awards, just weeks after receiving another accolade at the British Renewable Energy Awards. "BIPV uses non-toxic solar cell materials that are screen-printed directly onto the glass." The company received recognition for its Building Integrated Photovoltaic (BIPV) technology. Created by Dr. Henry Snaith and his team of 17 academics, BIPV uses non-toxic solar cell materials that are screen-printed directly onto the glass. The cell material is both transparent and self coloured. Glass is increasingly being used in new buildings, as either a feature of the design, or as the building’s main material. Oxford PV’s technology taps directly into this trend, enabling electricity to be harnessed not just from the top of buildings, as with traditional solar, but from the side panels and even windows. Founder and CEO, Kevin Arthur, says you’re most likely to see the solar glass on new, commercial buildings in the first instance. "That said, we are also talking seriously about a major retrofit scheme and also to a retailer, so all of these are good possibilities." The company says its technology is simple, cheap and scalable both in size and substrate and production volume. To add solar cell treatment to a glass facade costs ten percent more than the cost of the glass. For example, if a facade cost between £600 and £1,000 per square metre, the new cell treatment would cost just £60-£100 extra per square metre. "The company says its technology is simple, cheap and scalable both in size and substrate and production volume." Improving efficiency has therefore been a major area of investment and in February this year the company received £2m in funding from clean tech investor MTI Partners. The investment has already paid off and as recently as June the company announced it had achieved efficiency of 15.4%, up from around 12%. Speaking about this development, Dr Henry Snaith said: "Our plan was to continuously optimise our perovskite solar cells towards a goal of more than 20% efficiency but these results are ahead of expectations. "I see no reason why we can’t aim higher now and accelerate the transfer of our technology into production." With the new investment, Oxford PV constructed its own product development and test facilities at the Begbroke Science Park near Oxford, where the company now has 12 staff members. Here the company will work on further research and development. "Building of the product development facility is an important step on the road to full commercialisation," said David Ward, managing partner and head of cleantech investing at MTI. "Investment has already paid off and as recently as June the company announced it had achieved efficiency of 15.4%." Oxford PV also hopes to build a much larger manufacturing facility in 2014 with full size panels available for sampling and trials to be conducted by the end of the same year. In all, Oxford PV is currently backed by £4.2m in grant funding, but to continue development further more funding is needed. The company plans to raise around £5m from a ‘B’ round of funding at the end of the year. "Like most early stage technology start-ups, we need to continue to raise the necessary external investment…to make the transition from concept to product in a suitably fast time. "We have a tremendous opportunity to create a massively scalable product for the Building Integrated Photovoltaic (BIPV) market and then, as energy conversion performance improves further, for other high-volume PV applications," says Arthur. Once achieved, it’s hoped the only challenge left will be for the customer to pick the right colour, because, as Arthur adds, different colours bear different efficiency: "Black gives excellent efficiency and red is good, while green is ok and blue not so good," he says. Proving nothing is black and white in the business of renewable energy. Molten salt reactor: the face of new nuclear? A new molten salt reactor concept developed by US start-up Transatomic could change the face of nuclear power. Liquid Air: the future of renewable energy storage? Can excess renewable energy be stored as liquid air and then be transported to the grid?